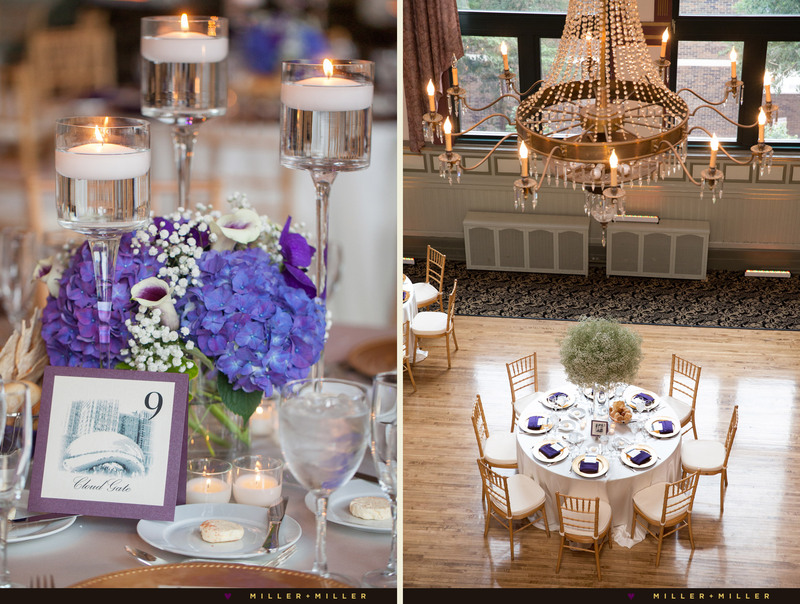 Chicago wedding receptions at the historic and heirloom Germania Place and wedding photography inside the Germania venue provide for an elegant, vintage, and old-chicago appeal. 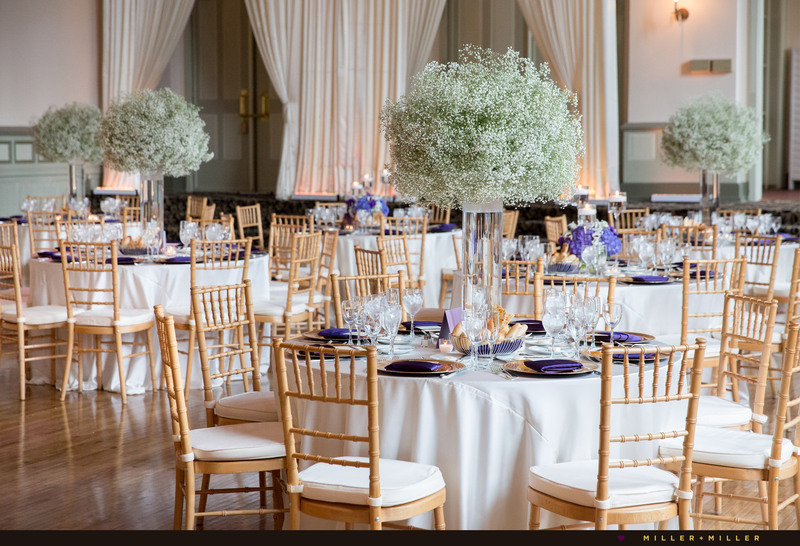 The venue Germania Place designed in 1888 offers a stunning historic landmark wedding venue space in Chicago. 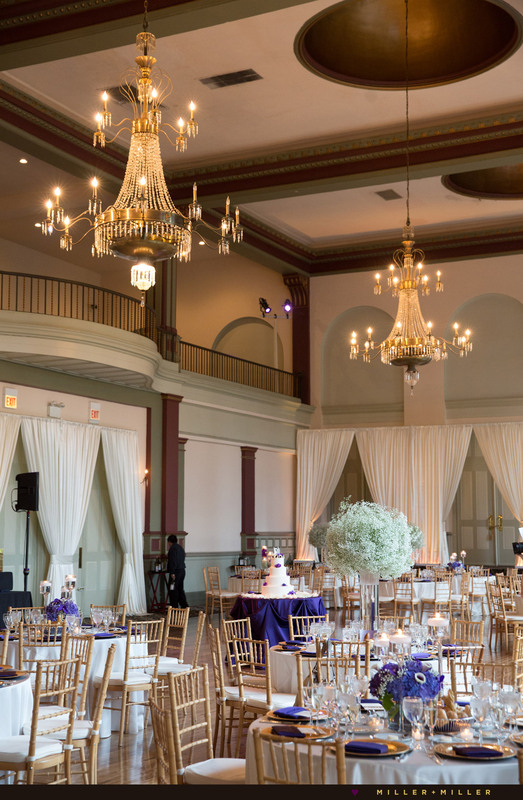 Built in America’s Gilded Age of the 19th Century and located in the heart of Chicago’s Gold Coast near Old Town, Germania Place endures as one of Chicago’s most famous and significant historical landmark buildings to hold weddings. 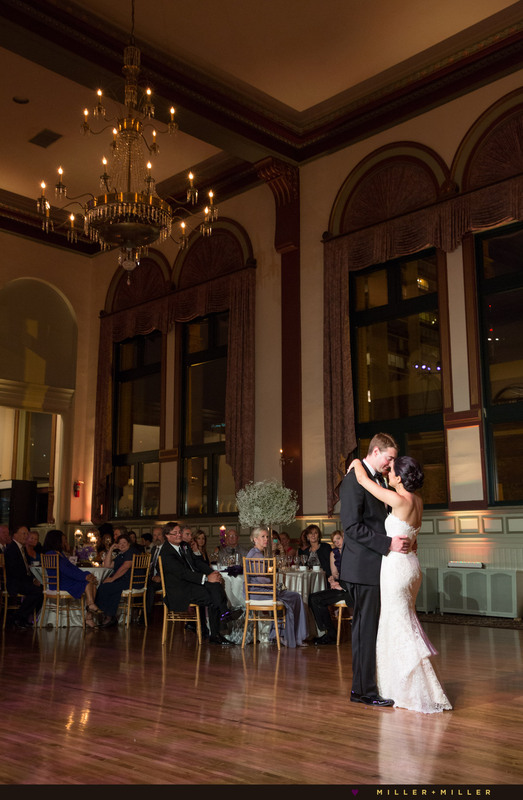 Weddings at Germania Place offer a piece of Chicago’s history to wedding guests when you choose to host your event in a building such as Germania that is listed on the National Registry of Historic Buildings in Chicago. 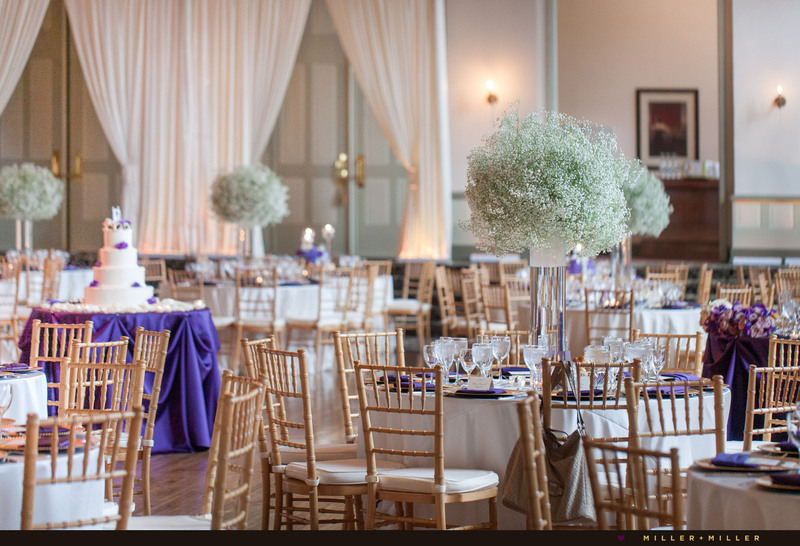 Germania Place has two palatial ballrooms ready to be filled with your day’s theme whether historic, vintage, elegant or classic. 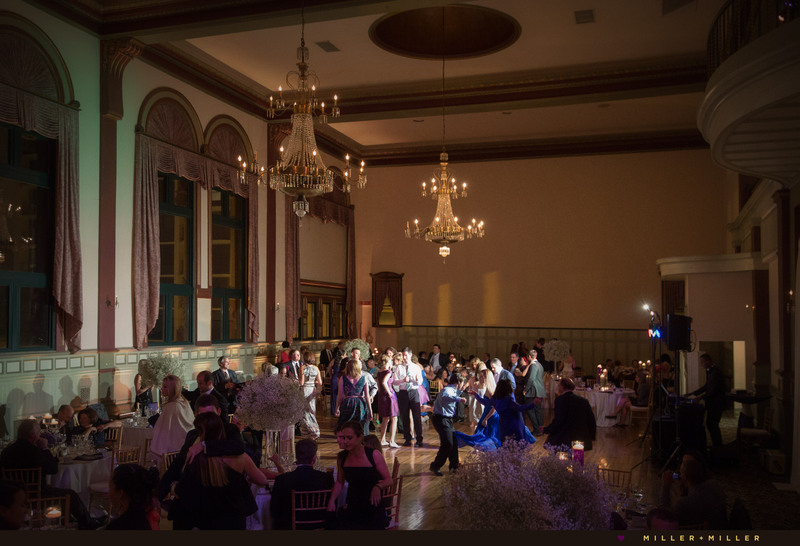 The main ballroom features soaring 50’ ceilings, inset gold domes, original crystal chandeliers, 20 foot arched windows, and an ornate Victorian architecture that offers a mini museum room design with old-world style. This vintage styled Chicago wedding venue also features two built in bars, a separate sun-drenched solarium, a 110 year old antique William Knabe Grand Piano, and a private dressing suite with bathroom. 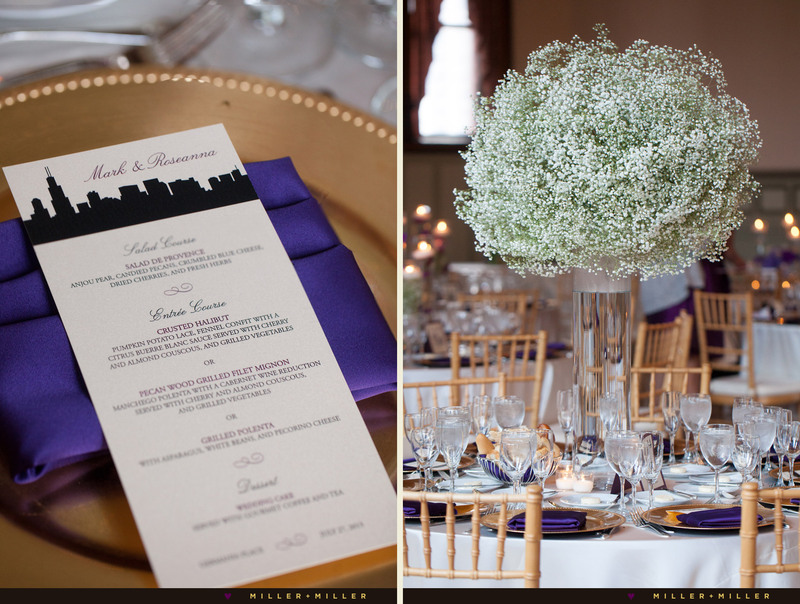 For Mark + Roseanna’s summer wedding day, the couple added simple classic florals featuring baby’s breath tall centerpieces, calla lilies and roses in shades of purple and blush pink complimenting the warm gold lighting and chandelier surrounding the room. 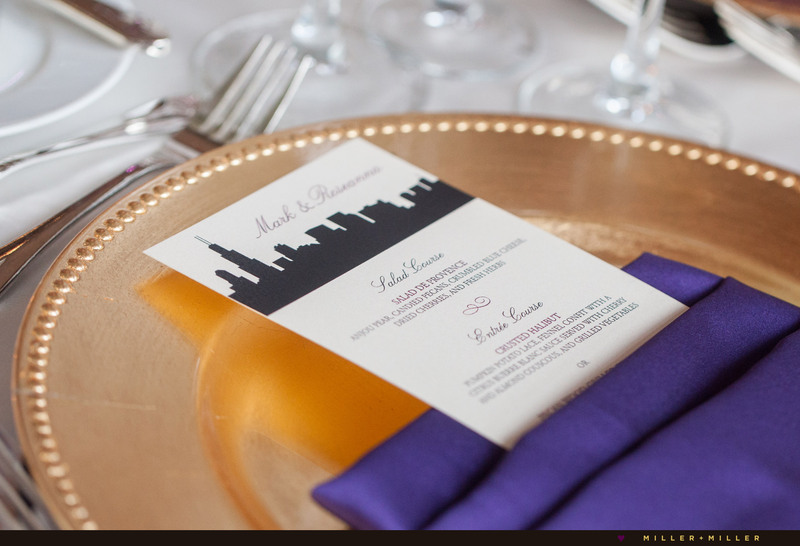 Touches of Chicago-oriented details surrounded the room with the tables design and reception decor. 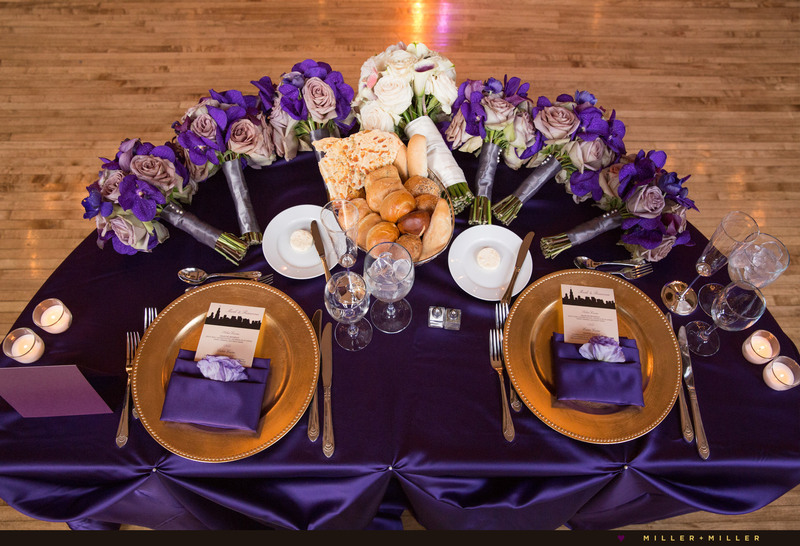 Flowers subtly and elegantly sat along side the Chicago themed and modern decor throughout the venue letting 100 year old fully restored ballroom’s gorgeous and vintage interior rooms at the venue shine. 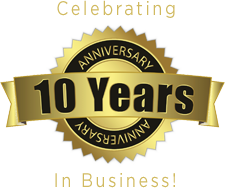 See below for more information about Germania a historic wedding event space in Chicago. 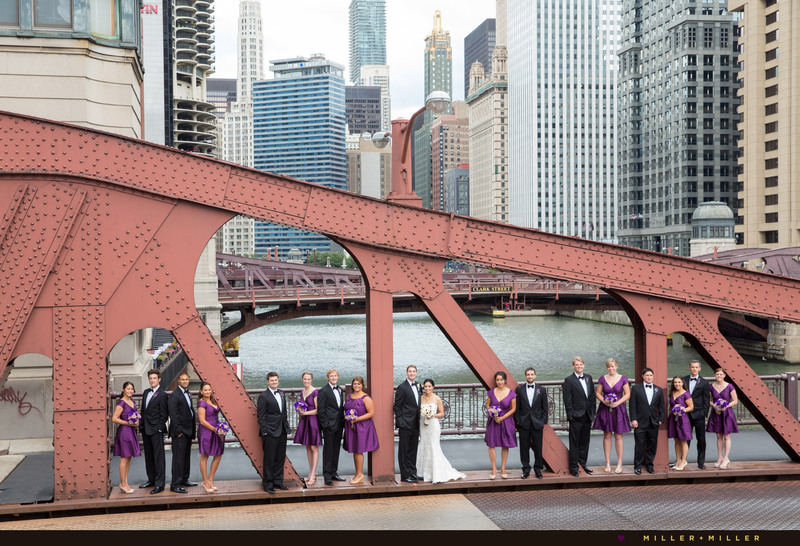 If you are on a search for your Chicago wedding photographers email us to inquire if your wedding date is available. For additional portrait examples, visit our Collections section for a variety of photo examples, portrait photography and our collection of wedding photography images. 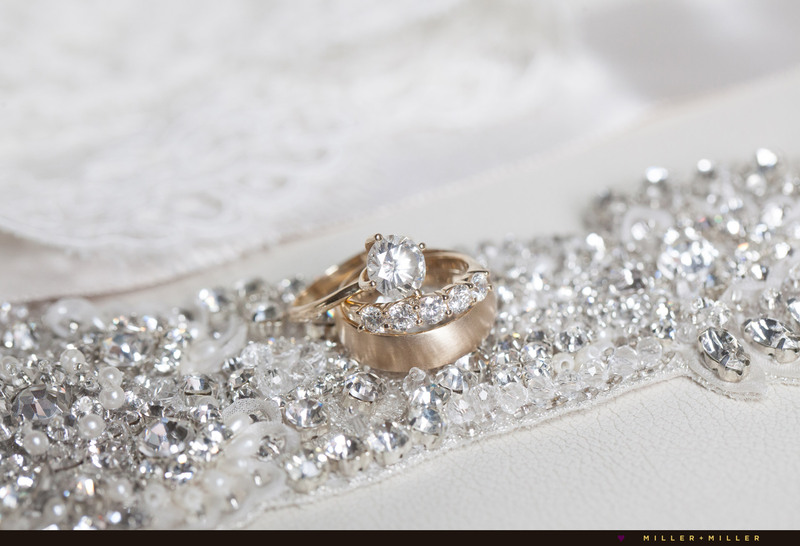 We love stylistically customizing photos for your wedding day to fit your theme, design or a specific look. 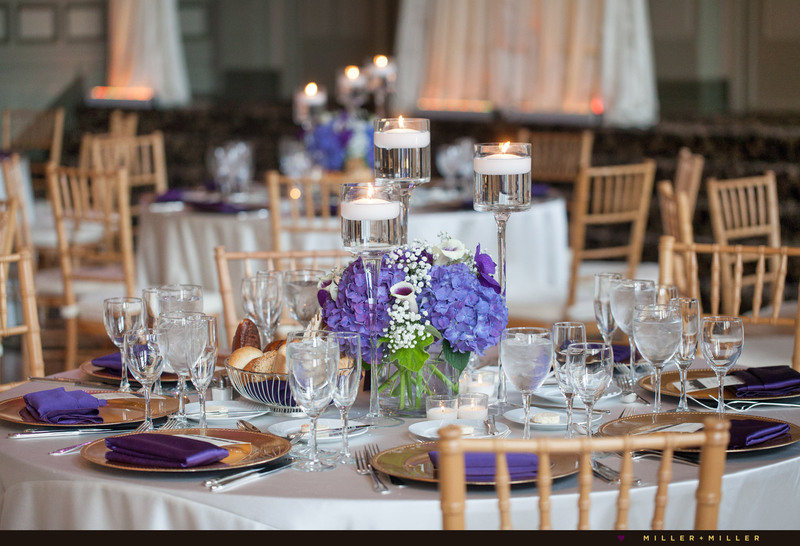 Whether your desire is tie in the 19th century, romantic vintage inspired photos, pictures at the historical setting of Chicago’s Germania Place, or if you look forward to traveling to off-site scenic Chicago locations, contact us to discuss your Germania wedding and plans. 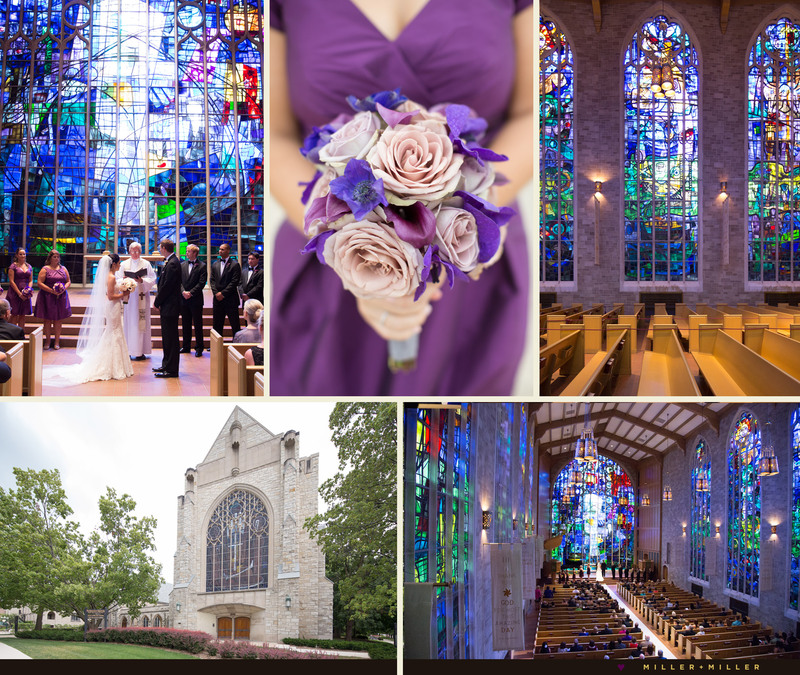 Details about Mark + Roseanna’s wedding at Germania Place included wedding day planning by Courtney & Charlene Liang of Sweet Chic Events, wedding theme colors of gold and purple, florals by florist Vale of Enna, and wedding ceremony at Alice Millar Chapel on Northwestern University in Evanston. 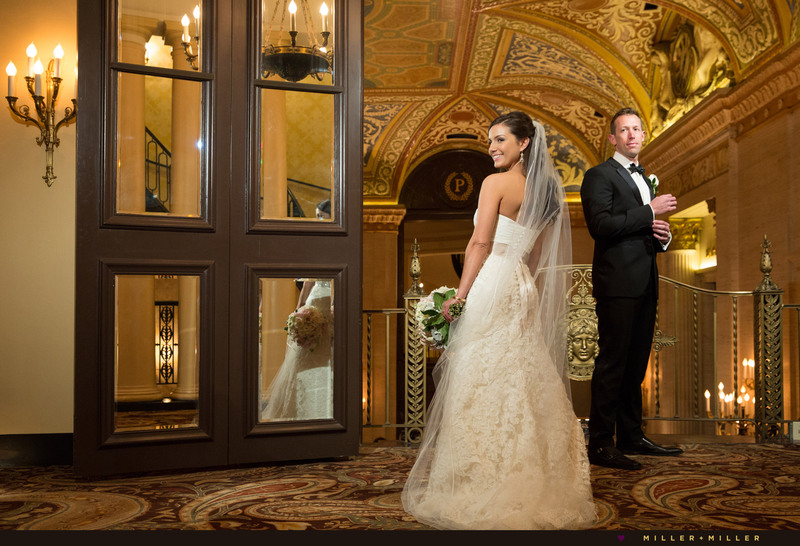 Pre-ceremony photos at the Palmer House Hilton, hotel Sofitel Chicago, and first look / outdoor city photos in downtown Chicago.